You must use a licensed plumber to install or remove tap ware, vanity units or toilets when renovating your bathroom. 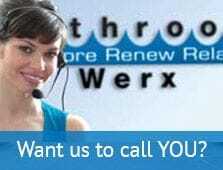 Bathroom Werx Technicians are more than happy to recommend a licensed plumber to assist you in these areas. Whether you are purchasing a new bathroom vanity unit, toilet or tap ware, it would be best for you or your plumber to remove the existing items prior to Bathroom Werx commencing work. This way we can repair any damaged tiles, and re-enamel behind them if required. Arrange for your plumber to install the new items after the Bathroom Werx Technician has completed their work. This will enable your plumber to apply any silicon if required around the new items. We need to remove bathroom shower screens in order for the walls and the shower base (or bath) to be re-enamelled. We then refit them on completion. Please note that removing and refitting a new shower screen may void your shower screen warranty. If you are planning on purchasing a new shower screen, please arrange for this to be fitted after Bathroom Werx have completed all their work. Please allow 24 hours for the new Werx Enamel to dry before the shower screen is fitted. 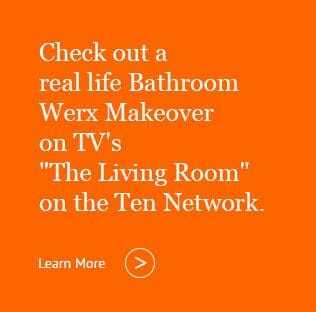 If you are planning to re-paint the walls of the bathroom to complete your bathroom renovation, we strongly suggest you do this after Bathroom Werx have finished their work. As we need to mask off all areas to protect them during the re-enamelling process, sometimes paint from the walls may be peeled off when we remove the masking tape which is unavoidable. If you are planning other work to be done in your bathroom, prior to Bathroom Werx commencing, that requires the application of silicon, please instruct the tradesman not to apply silicon as we will only have to remove it. We will replace any silicon necessary after we have completed our work. Step 1. Plumber - removes old vanity, toilet, etc., if they are being replaced. Step 2. Bathroom Werx carries out the work. Step 3. New shower screen fitted (if applicable). Step 4. Plumber - replaces new vanity, toilet etc. (if they are being replaced). Step 5. Plumber installs new taps (if applicable). Step 6. Paint your walls and ceiling (if applicable). We ask for a 30% deposit to secure your booking. The balance is payable on completion of the work. Please pay the Technician directly and they will provide you with a tax invoice. You can pay by cash, cheque, Visa, MasterCard, or Amex. Please note that Amex will incur a 1.5% surcharge.